Valley Oil Company was founded in 1947 by Arnold “Pete” Christiansen. He began his career in the petroleum industry at Shell Oil, where he started as a mail clerk and later became a truck driver. He serviced local farms, businesses, and even Hearst Castle while driving for Shell Oil. Pete formed strong and lasting relationships with this customer base, which laid the foundation for him to start his own business, Valley Oil Company, and deliver petroleum products to farmers and local businesses in his pickup truck. 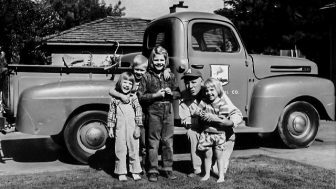 Pete Christiansen founded Valley Oil Company with a strong desire to serve customers with kindness and a friendly smile – always paying attention to the customer’s needs and expectations. This same focus on customer service was passed onto his son, Bob Christiansen, and Bob’s best friend, Bob Buck, when they became the owners of Valley Oil Company in 1974. The partnership between “the Bobs” took Pete Christiansen’s business model to the next level as the market changed and the customer base evolved from agricultural-based customers to manufacturing, high tech, property management, municipalities, service stations, and construction-based customers. 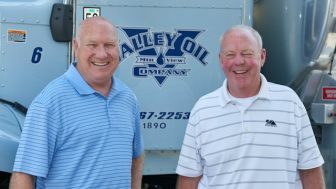 As the customer base evolved and grew through the 1960’s, 1970’s, and 1980’s, so did Valley Oil as a company. What was once a one man operation in 1947 grew to over 40 employees by the 1990’s. Our fleet of petroleum trucks grew as well, to over 20 trucks by the year 2000. That same year, Valley Oil Company rebuilt and expanded the bulk plant, CFN fueling station, and office building at our Mountain View headquarters. The plant now has over 65,000 gallons of on-site bulk oil storage, with 12 different oil products stored in individual tanks. The addition of several underground bulk fuel tanks increased the storage capacity to over 135,000 gallons of fuel on-site. This new facility enables us to better accommodate our growing employee base and fleet of trucks, provide excellent service to our customers, and adapt to the modern changes of the petroleum industry. Between 1995-2000, Valley Oil Company concentrated on expanding the fuel service offerings to include on-site fueling (wet-hosing of equipment) for construction sites and heavy equipment, as the construction industry was booming in the San Francisco Bay Area. We began working with national and local commercial general contractors and builders, national and local residential home builders, specialty trade contractors, general engineering contractors, and property management companies that all had fuel service needs for either their diesel-powered equipment or bulk fuel storage tanks. In addition to these customers, Valley Oil also began servicing the fast growing tech industry, which includes computer software companies, internet search engine companies, app developers, and data storage centers. Located in the heart of Silicon Valley—in Mountain View, CA—Valley Oil has a huge advantage in being able to provide timely service to its customers throughout the Bay Area. In 2012, Valley Oil Company expanded the on-site fueling service footprint to encompass the western region of the United States, to better assist construction industry customers who travel throughout the area for projects or have district/branch office locations within the region. In order to successfully take on this venture, Valley Oil Company formed, and maintains to this day, strong relationships with strategic partners located throughout the western United States. Together with our dependable strategic partners, Valley Oil Company currently provides fuel service throughout all of California, as well as Arizona, Colorado, Idaho, Montana, Nevada, New Mexico, Oregon, Texas, Utah, Washington, and Wyoming. We also work in Florida, Illinois, Iowa, and Wisconsin from time to time – and continue to explore additional service areas across the United States. In addition to Valley Oil Company’s rapidly expanding fuel services, we have also established ourselves as the greater Bay Area’s premier lubricant and oil products supplier. We operate 2,800 gallon five-compartment bulk lube trucks, as well as flatbed and pickup trucks for light load and tight-fit deliveries such as totes, drums, and cased goods. We carry all major brand lubricants and grease products, as well as our own “Valley Oil Company” brand of lubricant products, produced in cooperation with a top-tier partner specializing in quality oil and grease products. We can produce almost any lubricant and oil blends for our customers. As Valley Oil Company has grown, our attitude and approach towards customer service hasn’t changed. We have kept our focus on providing outstanding customer service with competitive and balanced pricing. Today, our bond with our customers has grown even stronger due to our steadfast attention to personal relationships and our respect for loyalty. Looking to the future, Valley Oil Company continues to focus on providing innovative petroleum- and energy-based solutions and excellent service to our customers across the San Francisco Bay Area, throughout California, and beyond. Contact us today to find out how we can provide you with the products and services that best meet your needs. “Service is our business – if we don’t stock it, we can get it.